Way back in time, when gods and monster rules an ancient land, an iron age community lived near the site. 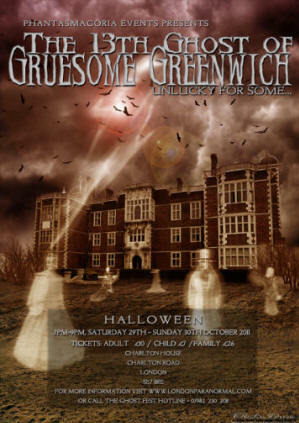 They created a portal to the spirit world – From the four corners of Greenwich, a legion of the borough’s most horrid and historical phantoms are drawn to the imposing Jacobean mansion. Once a year, at Halloween the portal opens to allow the trapped spirits to ascend to a higher realm. In order for the ancient magic to work, 13 spirits are needed. However, there is a catch. Only 12 spirits are in the house. They meet you, greet you, tell you there story, however they are watching you like a hawk. You could be the 13th. There is actually a real ghost that lurks through the halls of Charlton House (no, really!). It’s said to be Sir William Langhorne who bought the house in 1680. At the age of 80 he married a 17-year-old bride from Charlton Village. He was desperate to have a child to inherit his wealth but died two months after the wedding before his wife had conceived. He still haunts the grounds in the hope of finding a fertile bride.